This dish is so good that I made it twice last weekend...in my Girls' Night Out cooking class and as a side dish for a BBQ. Consider the recipe a guideline, not something to follow exactly. On Saturday, I used arugula, asparagus, peas, green onions, fresh radishes, dill, mint, and Parmesan cheese. 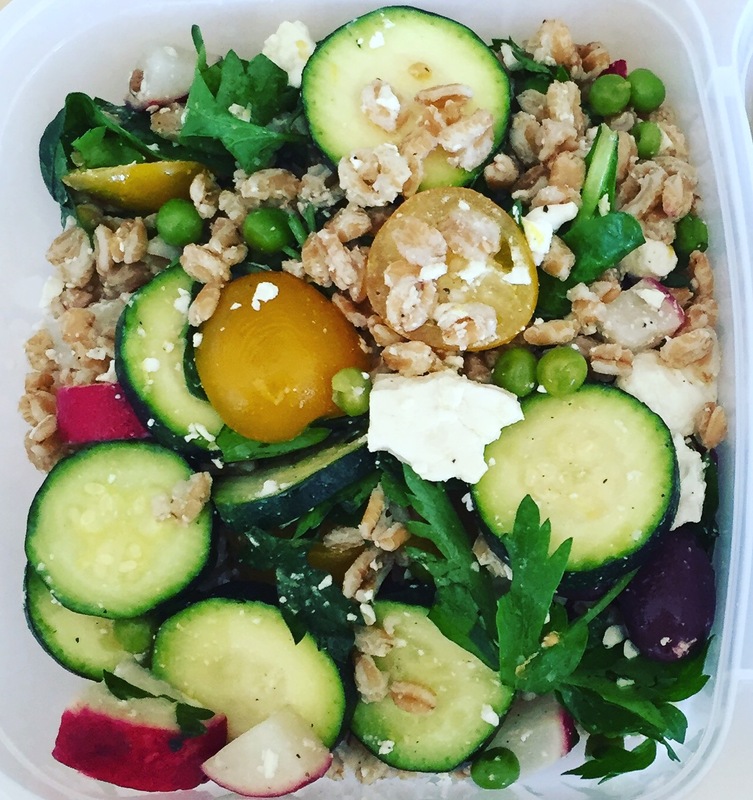 On Sunday, I added spinach, peas, radishes, zucchini, tomatoes black olives, parsley, and feta to the farro. The possibilities are endless. Really. As a side dish or main course, this salad is delicious...light but filling...and keeps well in the fridge. I took leftovers for lunch yesterday and today. Combine stock and farro in a medium saucepan; bring to a boil. Reduce heat to medium-low. Cover and cook 15 to 20 minutes or just until farro is tender (it will not absorb all the water). Drain and set aside to cool completely. In a large bowl, mix together the olive oil, lemon juice, lemon zest, vinegar and pepper. Add farro, vegetables, and herbs; toss gently to coat. Taste and season salad with salt, if needed. Serve at room temperature or chilled.